Catie Munnings is not your regular teenager – she’s a female rally champion. At 18 years old, during her final A-level exams, Catie won the FIA Ladies European Rally Championship in her first year in the sport. This made Catie Munnings the first Briton to win a European rally title in over 49 years! Catie’s interest in motor sport began early, following her father, she spent her childhood in his workshop getting involved in the family motor sport business. Growing up, there were very few female role models she could see in any sort of motor sport. Inevitably, Catie only saw her passion as a hobby, and not a career. This has made her recognise the importance of role models, especially in gender dominant environments. She began competing in auto-testing aged 14, and her talents were quickly recognised! At 17, Catie was invited to test a factory rally car in the French Alps. Having never sat in a rally car and was testing with the best drivers, cars and teams in Europe, it was a baptism of fire! The team, however, were very impressed and offered her a drive for the following season. Overnight, Catie’s life was transformed from a regular teenager looking at Cambridge University into a young prodigy. Catie had four months to train and find sponsorship, at the same time as dealing with the pressure of being Deputy Head girl of her school and revising for her final A-level exams. Having always been a ‘doer’ she thrived on the challenge. Making the choice between studying Veterinary Science and becoming a self-employed rally driver with no promise of success was one of the biggest decisions she made, but also the easiest. 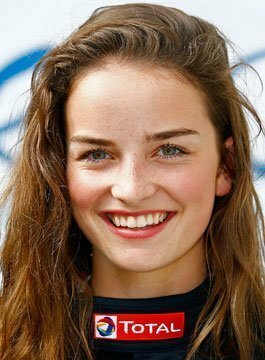 Catie was shortlisted to the top four of The Sunday Times’ Young Sportswomen of the Year awards, her rivals all being Olympians. She is now running an ice driving school with ex-world champions on the frozen lakes of Sweden, as well as competing in the European Championship. Munnings has faced challenges, such as dealing with prejudice in a male dominated environment; the sudden media attention and pressure to perform despite lack of experience and taking her last A-level exam in England on the morning of starting her first round of the European Championship in Belgium the same day! A current, up and coming athlete, Catie has learnt that your mind puts boundaries on what you believe is attainable, but with training you can undo the boundaries to discover your capabilities are limitless if you channel your energy positively. Catie’s inspires a field much larger than motor sport. At 19, she has overcome hurdles psychologically by training in quietening her mind to reach peak performance and make vital decisions in high pressured environments; had meetings with global CEO’s; spoken to 100 million people on BBC global news; learned about negotiation, teamwork, leadership and failure. An education that she feels could never be taught in any classroom. Catie works closely with organisations to even out gender ratio in work places, and encourages the next generation to challenge stereotypes and limitations put on them by society. Catie Munnings’ journey is ongoing. Her passion for life and doing what you love is contagious. Having proven how much you can do in one year if you put your mind to it, she wants to inspire others to do the same.